Keeping your customers warm and enabling promotional is a Top Priority this winter, and what better way than to do it with style? The Nuptse Promotional Jacket with Logo is the ideal personalised winter jacket, inspired from the Nuptse mountain, which lies exactly 2 kilometres South west of Mount Everest. 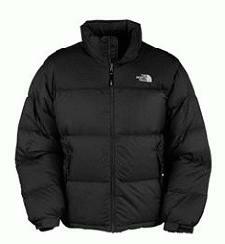 This is a promotional Classic North Face™ Jacket - a promotional item of superb quality and refinement. Filled 700 goose filling enables insulation and warmth in the toughest and coldest conditions. Ideal from promoting your business brand name and logo, we can print a large area on the left breast or the sleeve of the nuptse jacket, with a customised one colour vinyl print for maximum exposure of your company name. What better gift or freebie for your customers and clients alike? As a business gift of goodwill - personalise the perfect promo gift with our Nuptse Promotional Jacket with Logo this winter and make that difference. Three colour combination print available. For a FREE QUOTE please fill in our contact form regarding our Nuptse Promotional Jacket with Logo and we'll be able to help you.